In this month’s column I want to look at the third fall of Jesus. Just as with the earlier falls,I can’t find any reference to the fall in the gospels. The three falls are included for a reason. They carry a message for us and we have to figure out what it is. What is the significance of this third fall? The number three has had a mysterious significance for people since ancient times. Mathematicians list a whole range of special features of the number three. For example, according to Pythagoras and the Pythagorean School, the number 3, which they called triad, is the noblest of all digits, as it is the only number to equal the sum of all the terms below it, and the only number whose sum with those below equals the product of them and itself. Three is regarded as a magic number. Storytellers often used this in their tales. Think of children’s stories like the three little pigs. The story repeats with the big bad wolf attacking the pigs in turn. At the third pig’s house the wolf is defeated. This pattern is repeated in other stories, even some modern films. We might expect the third fall to be the end of the story on the way of the cross. After all Jesus is now exhausted. He has lost a lot of blood and has had a night of torture and no sleep. When Jesus falls again he knows what awaits him. There is no place to go. Why does he get up? That is the mystery here. He could easily have lain down and died there without the humiliation of the cross. Why, then,did he get up and struggle on? Jesus knew that he had to die in humiliation. He died to conquer death and save mankind, but the manner of his death had to convey a message to those who chose to follow him. In searching for the message I’m drawn to the image of a man suffering and on the verge of death pulling himself up and pressing on to face something even worse. That’s a message which strikes home today as we face calls to change the law to allow euthanasia. Why should someone suffer when they could die in dignity? Why should they not just give up? Jesus gives the answer to that question. His life had a purpose and he could not give it up before that purpose had been served. His Holiness, Pope John Paul II also saw the need to make a point about the sanctity of life. As he aged his body deteriorated and he suffered debilitating illness. Many people both in the Church and outside thought he should retire and make way for a fitter man. He decided otherwise and carried on in his vocation. I’m sure he would have made his decision after spending a great deal of time in prayer. He was reminding us of the message Jesus gave us in the manner of his dying. Everyone has value, the poor, the sick and the dying. John Paul may have been physically wrecked but mentally he was fit to carry on. I believe Jesus’ message to us was to show us how we must value the gift of life and the reason we have it. That is not the only message he left us.Jesus showed us something about humiliation. Nobody wants to be humiliated. None of us want to be ridiculed in public. When Jesus allowed himself to be humiliated before the mob around the cross he was sending us a message. When people humiliate you they do it for a reason. The Jewish authorities had to humiliate Jesus in public to protect themselves. They wanted to put an end to his teaching that exposed the hollowness of their own teaching. By humiliating him they hoped discourage his followers and remove the threat to their authority. How often do we see this today when someone can’t be overcome in a debate and their opponent makes personal attacks on them? How often are people howled down in Parliament when their opponents have no answer to their questions? The message of the ninth station is clearly that we should never be afraid of being attacked or abused for our faith. In fact we should be happy when we are abused for being a follower of Christ. The abuse is not only a conformation of the correctness of our cause but it is much more. Suffering abuse for the faith allows us to share, in a very small way,the humiliation that Jesus suffered. It also gives us an opportunity to show others that we can face up to the abuse and not give up our faith. Recent events in the Middle East have given us the example of Christians who were faced with the choice of giving up the faith or being killed. Many fled before the Isis terrorists but some gave up their lives, some beheaded in front of their children. We are more fortunate than those poor souls, but their sacrifice should be an example to us. Where we are expected to do much less than them, surely we should be ready to stand up and be counted for the faith. This is the purpose that the Christian has in life. Our lives are a gift and we are asked to use that gift to work for the coming of the Kingdom of God. We may all have different roles in life but we are all expected to bear witness to the Father. We can do this every day. We can do this at home and at work. We must bear witness to everyone we encounter, every day. We bear witness by behaving as Christ would in dealing with the joys and fears, pleasures and pains that life puts before us. We show the world a better way by our reaction to the problems of the world. How do we react to those who are suffering at the hands of Isis? What do we do about the refugees from the fighting in Syria? We can make a financial contribution but, is that it? Can we walk away safe in the knowledge that we have done our bit? The Christian calling is not a simple matter. Trying to be like Christ is setting ourselves up to fail. We will never match him. It’s not about succeeding but about how we go about failing to match our Saviour. 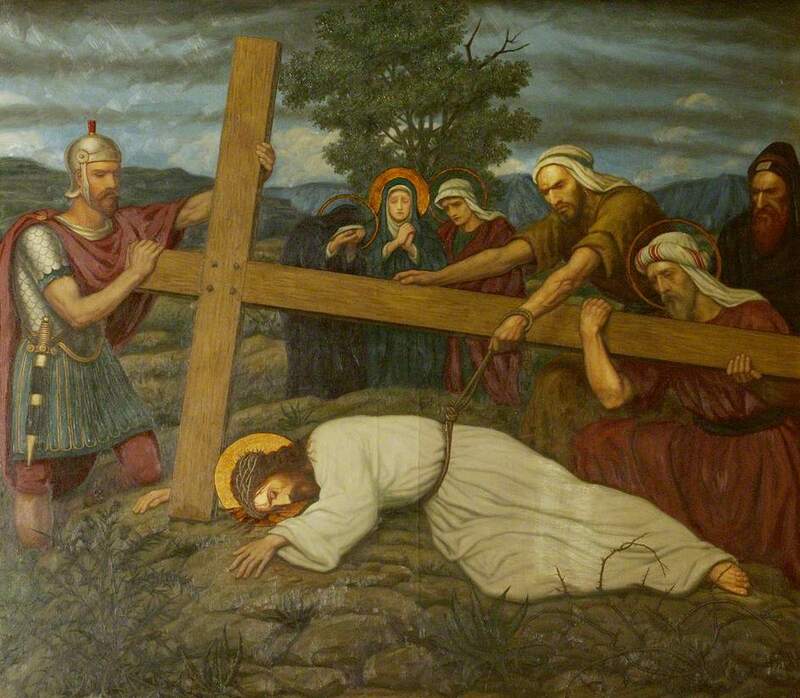 The ninth Station on the Way of the Cross;- Jesus Falls the Third Time. Why is this significant? Why did he fall only three times? Why did he get up again? For my thoughts on this mystery get your copy of the Scottish Catholic Observer this weekend. It’s out today. My column should be there. If you are away on business or holiday or still have your head tucked under the blankets duvet afraid to find out the result of the referendum then the full text will appear here next week. The paper is better though with so many other interesting writers. (Should I have left out ‘other’? ).